Previously we explored the business case for consistency both within individual channels and across multiple channels. In this post, we will explore consistency of treatment in a demographic context. Inconsistent treatment based on certain demographic characteristics is illegal. The Civil Rights Act of 1964 prohibits discrimination in almost all privately owned service industries based on race, color, religion, gender, or national origin. Other industries, such as retail banking, have additional regulatory requirements. Beyond this legal risk, managers must be aware of the significant risk to the reputation of the brand posed by discriminatory practices. Managers may seek comfort in the knowledge that their company’s policies and procedures are not to refuse service to anyone. However, this overt discrimination is just a small part of the risk associated with discrimination. Beyond overt discrimination, which is extremely rare, there are two other categories of discriminatory practices: disparate impact and disparate treatment. Disparate impact is the result of policies or business practices which have an unequal impact. A restaurant with a policy to require prepayment for meals from one demographic group and not another is an example of disparate impact. Disparate treatment is differences in treatment that originate at the customer-employee interface. Disparate treatment does not necessarily need to be a conscious act. It can be an unconscious pattern or practice of different treatment that the employee is not even aware of. The use of name, offering promotional material to a customer of one group as opposed to a customer on another group are all examples of disparate treatment. Now, observing differences is treatment is not necessarily proof of discrimination. Human behavior, after all, is variable. There is a certain amount of normal variation in all service encounters. The trick is to determine if disparate treatment observed represents a pattern or practice of discrimination. Fortunately statistics has the answer, we use statistical tests of significance to determine both if observed differences in treatment are the result of actual discriminatory practices and the likelihood that any one member of a protected class will be treated differently than a member of another protected class. It should be noted, however, that regulatory agencies set the bar much higher. Many do not necessarily rely on statistical testing. In their view, any single case of disparate treatment is evidence of discrimination. In a future post we will discuss the implications for customer experience researchers in testing for disparate treatment. Previously we explored inter-channel consistency and its implication for customer experience managers. Inconsistent customer experiences are a significant threat to customer loyalty. In a previous post, we observed the casual relationship between consistency in the customer experience and feelings of trust and loyalty. As this plot demonstrates, consistency correlates with quality. 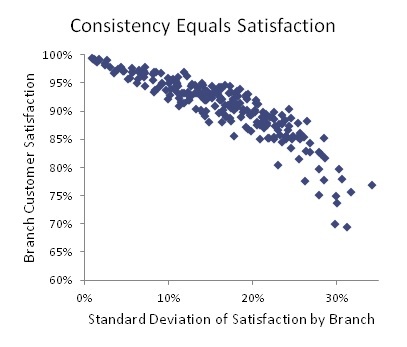 Branches with higher customer satisfaction ratings are also the most consistent. 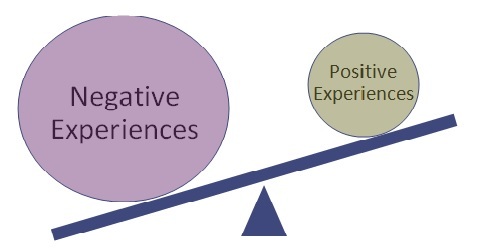 In our customer experience research proactive we see this time and time again. Additionally, this plot also demonstrates that top-line averages of customer satisfaction can be misleading. The bank in this plot had an average customer satisfaction rating of 93%. 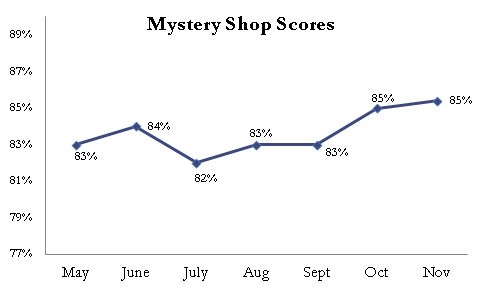 However, many branches fall well below this top-line average, resulting in an incomplete picture of the customer experience. 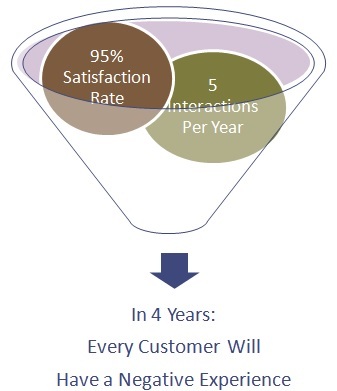 Customers do not experience top-line averages; they experience the customer experience one interaction at a time at the local business unit level. The first implication for managers is the above observation that top-line averages can mislead. 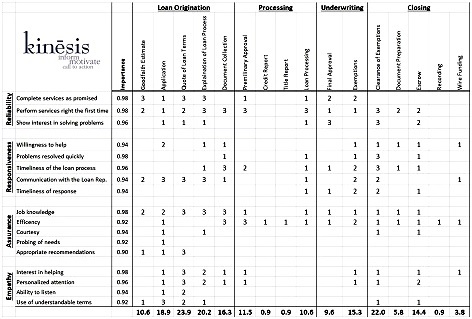 Top-line averages hide individual business units with both low and inconsistent customer satisfaction. Top-line averages come between management and customers, distancing managers from how customers actually experience the brand. Secondly, variation must be managed at the cause. 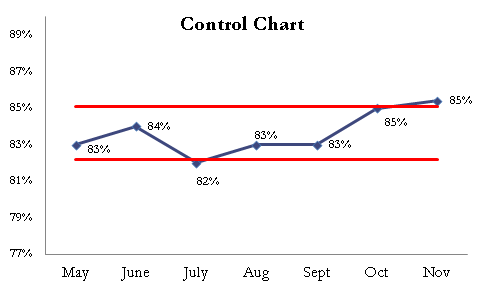 Intra-channel variation is almost always at the local business unit level. 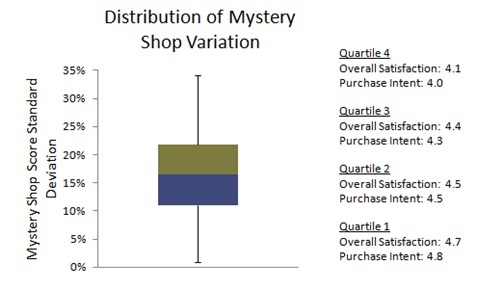 For example, a store with a high degree of variation in customer traffic will experience a high degree of variation in the customer experience if management does not mitigate the effects of the variation in traffic. Intra-channel consistency needs to be managed at the local level – individual stores and agents. Tools need to be available deep into the organization to allow managers at the lowest level of each channel to deliver a consistent experience. In the next post we will explore demographic consistency, treating all customers the same regardless of their demographic profile.